"Itlog sa umaga, Gatorade sa Gabi!" 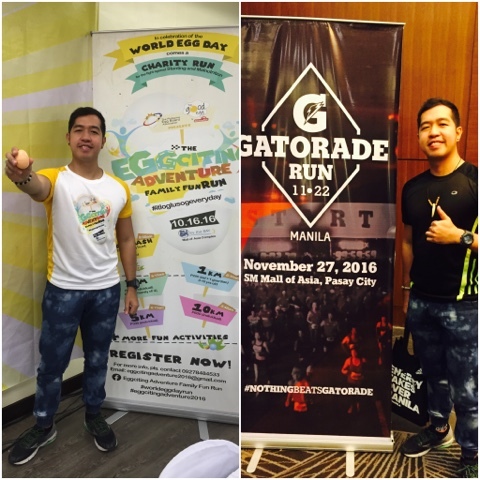 That is how I described my September 15, 2016 day when I covered a back-to-back media launch for two upcoming running events - the Eggciting Adventure Family Fun Run and the Gatorade Run 2016. Organized by the Guerilla Race Team, the Eggciting Adventure Family Fun Run will be on October 16, 2016 at the SM Mall of Asia which 3K, 5K, and 10K categories. On the other hand, the Gatorade Run handled by Runrio is already on its second installment. The actual running event will be on November 27, 2016 at the SM Mall of Asia with two categories namely 11K and 22K. The good thing about the conference and meeting room available online is that they are equipped with modern facilities. At meeting space San Francisco there are special facilities that are available for your presentation or if you have any special requirements.